There are plenty of crypto and blockchain projects that want to change the travel industry. Only a few of them actually have a working product, and LockTrip is one of them. I found out about LockTrip by chance, and it’s a very good tool if you want to book a hotel room somewhere in the world. Especially considering that LockTrip provides a serious discount against booking platforms like Hotels.com, Booking.com and Trivago. The promise of LockTrip is quite simple. It’s a blockchain powered marketplace for hotel and property owners. The benefit here is that these rooms are rented directly to consumers, without the need of middlemen. That’s what you can find hotel rooms on LockTrip that are 20% cheaper than Booking.com. Currently the platform has over 100 thousand hotels in their system. With many cryptocurrency and blockchain powered projects, you first need to buy their coins before you can do something. LockTrip found a solution to this problem. Consumers can just pay with their credit card, with bitcoin, or ethereum, and their internal exchange will convert the money into LOC. After that it goes to the decentralized LOC Ledger for processing. LockTrip is free to use for hotels and travelers, and they will never take a commission. Technically this LOC Ledger is powered by computers that are staking the LOC tokens. This is currently being tested on their Test Net. The wallet for main net is not active yet. LOC is currently traded on several exchanges, including Kucoin. I took the liberty to compare prices of hotels on a variety of booking websites. Below I handpicked one example, to show how much the prices can differ on LockTrip. 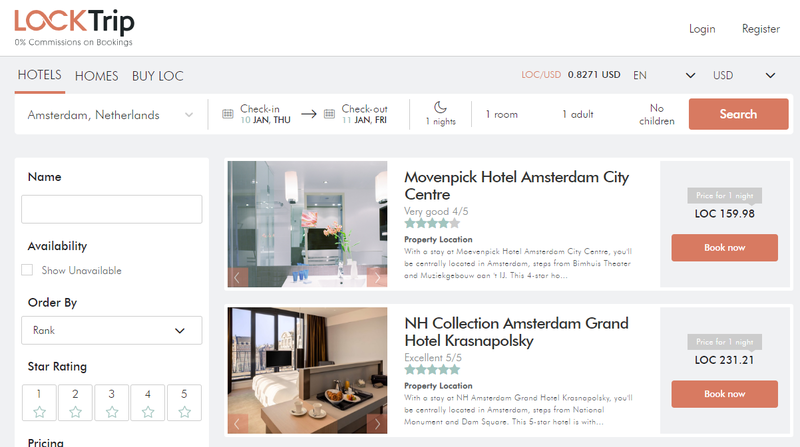 All these prices are for one night, one person, on January 10th — 11th 2018, and in the Movenpick Hotel in Amsterdam, The Netherlands. That’s 48 to even 57 EUR price difference! Now you might wonder how LockTrip makes money, if they are not taking commissions. LockTrip makes money by becoming more valuable. There’s a total supply of 18.6 million LOC tokens, with currently half of that in circulation. However, the plans of LockTrip don’t end here. The company is working on launching their own main net, with a test net currently being tested. On top of that they also want to offer global air travel service, also without any commissions. What LockTrip wants to do, is make their LOC tokens a needed utility for both tourists and the hotels. There’s low supply 18.6 million, so when demand goes up the value of LOC will increase as well. The team will also introduce a burning mechanism, where staking wallets will burn a small percentage of each reward they get. This creates a scarcity, and therefore adds value. Also, people who stake LOC will get voting rights. Once you vote on a change, for example transaction fees, the LOC used for the vote will be burned. Ultimately other parties will also be able to use the LOC blockchain, as the company is planning of introducing LRC20 tokens. LOC tokens aren’t only used for booking rooms and staking. Hotels can use the tokens to create better visibility on the booking platform, or hotels get to upload more photos, get access to more statistics to optimize their performance on the platform. Both the users and the hotels are able to use LOC for their own benefit. It’s obvious that LockTrip isn’t run by anonymous people. This business is run by the founders of Bitcoin7, an early crypto exchange established in 2011. Among their business advisors are former Bulgarian president Rosen Plevneliev and Eva Maydell, a Member of the Eurpean Parliament. The team has been made public on the official website. Provides a financial benefit for consumers, which generally is the best benefit we can get. Staking mechanism to earn LOC rewards will be introduced soon. If I have to name one thing… Success of a platform stands or falls with marketing. They’ve done an airdrop and some other activities, but nothing caught my eye. I bumped into this product by accident. I’d say marketing has been one of their weakest links so far, but they got the excellent discount on their side and word-by-mouth will do well. LockTrip is a product with lots of potential. The next time I will be booking a hotel, I will definitely use this service. I simply love the utility of it, and how blockchain technology provides a cheaper (and therefore better) option for consumers.